This is the album that, despite the title, sees the combative and essential Alabama rock outfit who are more ‘punk’ than many of the modern bands who claim to be, hit full maturity. It is also an album that goes beyond any “protest” label and instead paints a picture of a fractured society from within, albeit one that offers no little optimism. Where previous album “Dereconstructed” was a blistering, all-out attack, Youth Detention retains the power but offers more musical diversity. While Bains’ stream of consciousness and incisive social commentary lyrics are as sharp as ever, this is an album you could easily buy for the music alone. 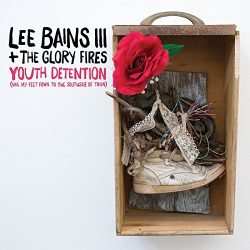 However, you will not want it for the music alone as Lee Bains has the gift of taking you inside Southern American society in a way few others can, with this superb collection of songs from the perspective of growing up in Birmingham Alabama. With songs such as Breaking it Down, Sweet Disorder and Black and White Boys among the opening tracks, you are left in no doubt that this is as good a musical snapshot of an America we hear too little about as you could wish for. Whitewash is striking in as much as it less full frontal assault and more inclined towards an acoustic melody. However, the lyrical content ensures that it loses no impact for that. Later track, The Picture of a Man, is even more acoustically inclined and a perfect counter-point to the other heavier tracks. I Can Change and Nail My Feet Down to the South Side of Town are irresistible sing-along anthems while Tongues of Fire is a coruscating assault on the senses. It’s possible to argue that if Lee Bains had emerged from London in 1977, he would have assumed legendary status, at least in the UK, such is the power and mosh-pit-primed appeal of his socio-political message. However, what we have is an uncompromising insight into the realities of life for young Southerners set to one of the best soundtracks you will hear all year. An outstanding album and a much-needed one at this time. Brilliant and blistering document of Southern youth.